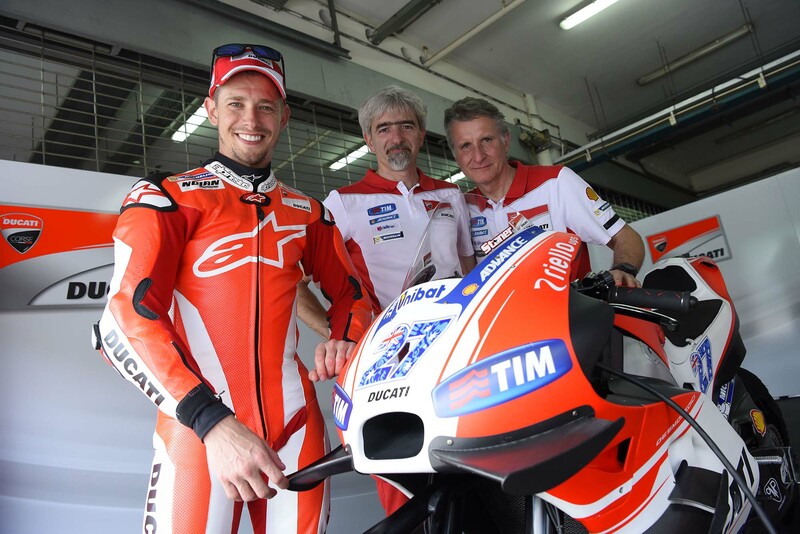 Casey Stoner got the first testing miles of his return to Ducati under his belt on Saturday. The Australian started slowly and steadily, doing a lot of short runs to get a feel for the Ducati Desmosedici GP15, on which he spent most of the day, before upping the pace later in the afternoon. Journalists present at the test said Stoner looked a little stiff in his early laps, not getting either elbow or knee down, but soon started to relax, and look more like his old self. He had every reason to be wary: the last time Stoner rode a race bike on the road was during the Suzuka 8 Hours, where a throttle cable malfunction saw him thrown from the bike, injuring his scapula and tibia in the process. Furthermore, this was his first time on a MotoGP bike for a year, his first time riding the Ducati GP15 – a very different beast indeed to the GP10, the last Ducati Stoner raced – and his first time on the Michelins. Despite that, he told reporters he was very happy with how the test went. Stoner praised the both the power and the power delivery of the Desmosedici. It had “grunt everywhere,” Stoner said. He was also positive about the aerodynamics and the stability of the bike under braking. All of the bike was very good, and he had been surprised at just how comfortable he had felt on the bike. Stoner was also asked about the spec-electronics, and how they felt. He had been impressed at just how good the spec-software already was, he said. The electronics felt as good as they were just a couple of years ago, rather than the eight or nine which Valentino Rossi had said. Stoner felt that if anything, the electronics were still too good. What was needed was to go back to the electronics of 2006, where they have very limited influence. No official times were released, though Stoner was apparently not too far off the pace. Peter McLaren of Crash.net recorded Stoner’s fastest lap at a 2’03, but McLaren said he had only sampled a few laps, not every single lap that the Australian put in during the day. 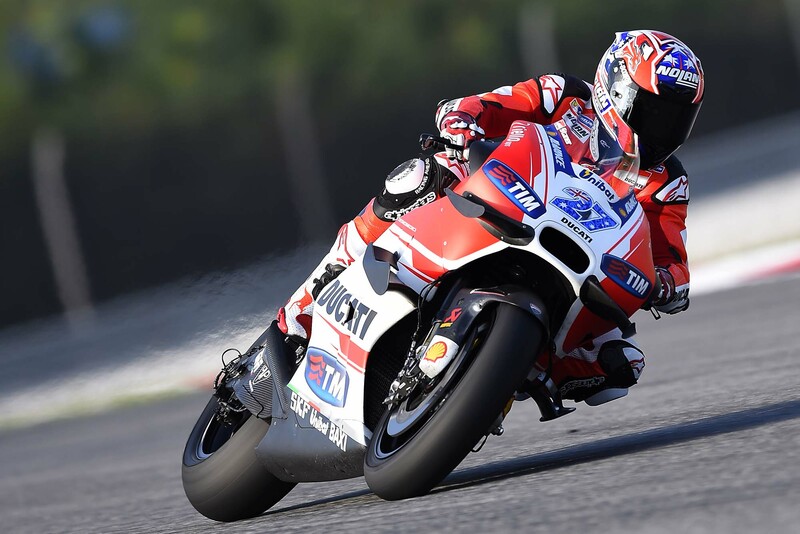 Italian Sky TV commentator Guido Meda claimed that Stoner’s fastest lap was a 2’02.1, set on the GP15 using old tires previously used by Ducati’s other test rider Michele Pirro. 2’02.1 is entirely respectable for Stoner’s first time back on the bike after such a long time away, and on a machine which is entirely new to him. The race lap record is a 2’00.606 set by Jorge Lorenzo during the 2015 race, while the pole record is held by Dani Pedrosa, who set a 1’59.053. During testing last year, Marc Marquez set an unofficial record of 1’58.867, but that was after three days of testing, and on Bridgestone tires. >Despite being relatively quick, Stoner once again emphasized he had no real interest in a return to racing. “I’m not here to kickstart my career,” he told reporters. Instead, he saw his role as doing everything he could to help Ducati achieve the results he believed they deserved. A wildcard would provide an ideal test environment, he said, but he had no intention of doing one at the moment. 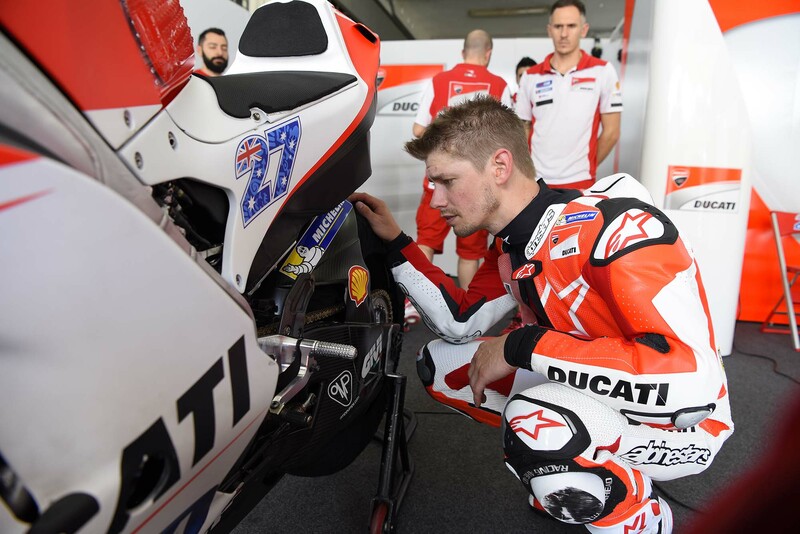 Stoner was due to continue his test on Sunday, but a last-minute change of plan after a debrief with Ducati engineers sees him sitting out the second day of the private test. 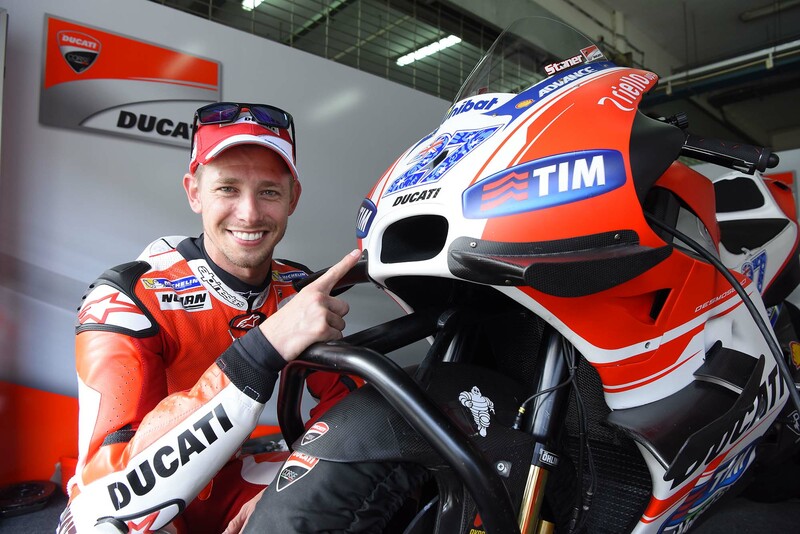 Instead, Stoner will take part in the official IRTA test at Sepang, due to run from 1st to 3rd February. Ducati decided they had other things that needed testing on Sunday and Monday, and that was best left to Michele Pirro. 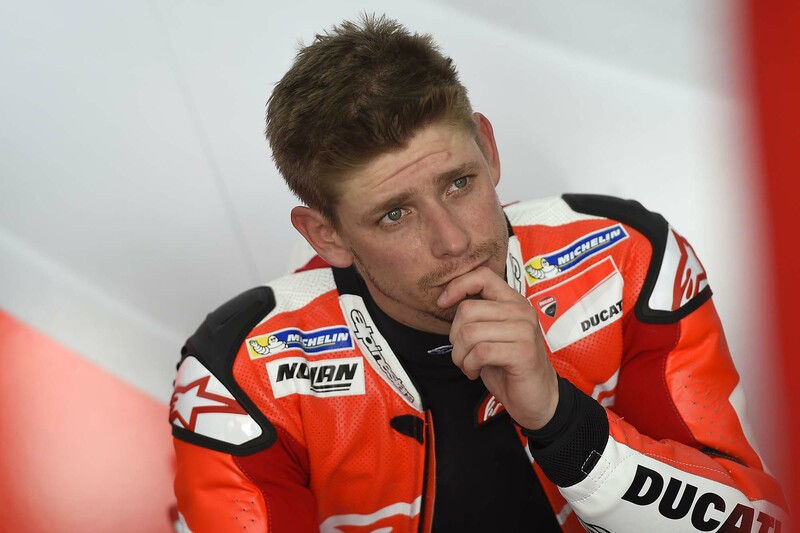 For a full report on what Casey Stoner said at Sepang, see Peter McLaren’s story over on Crash.net. Stoner spoke to the media after the first day of the private test at Sepang, used by the factories to prepare for the main test which starts on Monday. Being a private test, rather than an official MotoGP test run by Dorna and IRTA, Dorna do not hold the exclusive video and audio rights at the test. This allowed our enterprising friends over at GPOne.comto video the entire media debrief, where Stoner spoke the press present at the track. Asking the questions were Paolo Scalera and Matteo Aglio of GPOne.com, Peter McLaren of Crash.net, and Matt Birt, TV commentator for MotoGP.com. You can see more of GPOne’s videos on their Youtube channel.